Reanalyzed foot and handprints may date to thousands of years before many thought the roof of the world was settled. (Inside Science) -- Surrounded by mountain ranges holding the highest peaks on Earth, the Tibetan plateau was one of the last places on the planet that humanity colonized. Now scientists find that people may have occupied the Tibetan plateau thousands of years earlier than previously thought, a discovery that could help shed light on the way humans evolve in response to challenging scenarios. Often called "the roof of the world," the Tibetan plateau is the largest expanse of high ground on Earth, reaching more than 2.5 million square kilometers in size -- an area roughly 50 percent bigger than Alaska -- and on average standing more than 16,000 feet above sea level. At such elevations, air only has about half as much oxygen as it does at sea level. This can lead to potentially deadly altitude sickness if people move up to such heights too quickly, with possible symptoms including fluid in the lungs and swelling of the brain, said study lead author Michael Meyer, a geologist at the University of Innsbruck in Austria. The high altitudes of the Tibetan plateau -- even in its valleys -- made it difficult for people to dwell there and raise children until they genetically adapted to its thin air. Prior work found that people there possess bigger lungs and faster breathing rates than people who live in the lowlands, helping them deal with low oxygen levels, Meyer said. Scientists hotly debate when humans first colonized the Tibetan plateau. Discovering when people first permanently settled the area would yield insights on the rate of human evolution there, said study co-author Mark Aldenderfer, an archaeologist at the University of California at Merced. 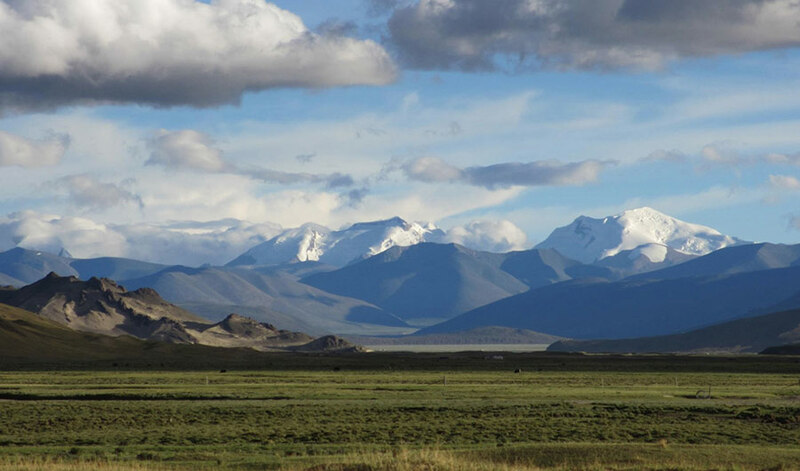 To learn more about when humans first occupied the Tibetan plateau, the researchers investigated a site near Chusang, a village located roughly 4,270 meters above sea level about 80 kilometers northwest of Lhasa, Tibet's capital. Hot springs in the area likely helped serve as refuges for animals, plants and humans, Aldenderfer said. The site, which scientists first learned about in 1998, possesses 19 human footprints and handprints fossilized in rock. Size variations in the imprints suggest that up to six people created them, including possibly two children. Previous research suggested that the imprints at Chusang were roughly 20,000 years old, but the lack of artifacts of that age near the site and the complex nature of the area in which the prints were made cast doubt on those dates. To reanalyze the imprints, Meyer, Aldenderfer and their colleagues examined 11 different samples from Chusang using three techniques: carbon dating, uranium-thorium dating, and optically stimulated luminescence dating. Previous models of the peopling of the higher-elevation zones of the Tibetan plateau suggested that permanent settlements could have appeared in the region about 5,200 years ago. The new reanalysis suggests that Chusang was inhabited at least about 7,400 years ago, but perhaps as long as roughly 12,700 years ago. The researchers noted that during these ancient times, roundtrips to Chusang from other sites likely took dozens of days across rugged, mountainous terrain, and routes there may have been impassable for much of the year due to heavy snowfall. As such, the site at Chusang likely was not a place that was visited only seasonally, but may have been a permanent settlement of hunter-gatherers living off the land year-round, Meyer said. "These findings overturn previous models of what humans were capable of during this period," said Christina Warinner, a molecular anthropologist at the Max Planck Institute for the Science of Human History in Jena, Germany, who did not take part in this research. "I wonder if the warm and wet microclimates created by hot springs facilitated the movement of people further onto the plateau than would have otherwise been possible." The scientists noted that this new range of dates more closely match estimates from some prior genetic analyses of modern Tibetan plateau peoples, which suggested permanent settlements appeared there at least 8,000 years ago. These new dates also coincide with a warmer, wetter climate in the region at that time. "Once the planet slowly recovered from the last ice age, the monsoon kicked in again and delivered a lot of moisture to the interior of Asia, the Tibetan plateau included," Meyer said. "Fauna and flora were certainly much lusher, the Tibetan lakes full with freshwater, and hunter-gatherers might have started to explore new opportunities on the plateau." Future research could look for even older sites on the Tibetan plateau. "I don't think Chusang is the earliest site that's going to be found in high elevations in this region," Aldenderfer said. The scientists detailed their findings in the Jan. 6 issue of the journal Science.